To lose one major player in the build up to a major sporting is unfortunate and to lose two would be enough to be classed as unfortunate. However, you really need to make up a new saying to signify the fortunes of Team USA heading to the FIBA World Cup in Spain this summer. The horrific injury sustained by Paul George has been bad enough but there have been plenty of other players pulling out, perhaps fearful of suffering an injury like George, or perhaps knowing that it is their domestic basketball career that affords them a luxury lifestyle. 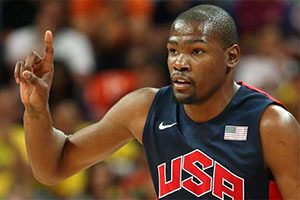 The latest blow for Team USA, and the latest glimmer of light for all other teams competing at the event, comes with the news that Kevin Durant has now pulled out of the major sporting event. The loss of another star name may seem some basketball fans reconsidering their betting with respect to this summer’s major event. If you believe that the American team has now been considerably weakened with the loss of yet another star name, you may find that betting on Spain or an outsider is a viable option for the 2014 World Cup. The final 12 players in the Team USA roster is yet to be decided but the team selectors have decided to draft in Rudy Gay into the final 16. If Gay makes the squad, this will inevitably leave some players feeling left out and annoyed at his late arrival on the scene but this is the nature of major basketball events. The loss of Kevin Durant is a big one, and he needs to be replaced in a real manner. This means that a player in a similar position needs to be called up but it also means that a player with a similar stature and nature needs to be called into the squad to maintain the drive and intensity of the squad. Will fans of the Kings be happy about Gay’s call-up? Whether the Sacramento Kings fans will be too happy at the thought of Gay keeping himself busy this summer is another matter altogether. There is a lot to be said for the fact that fans of the Oklahoma City Thunder will be feeling a bit happier with Durant’s withdrawal of the squad. While there will be slight concerns about the player citing mental and physical exhaustion, but in all honesty, these are the sort of quotes that people give when they were looking to get out of something. He may be tired at the moment but you can guarantee that come the time of the new season, Kevin Durant will be firing on all cylinders for the Thunder. There will be plenty of people saying that this latest call-off, in association with all of the other call-offs, have weakened the FIBA World Cup. In the eyes of many NBA fans and players, this would be a fair assumption but for the grand scheme of international basketball, the FIBA World Cup is massive and this remains the case, even if Kevin Durant is not going to appear. There has been a lot of problems with some of the star names on the approach to the FIBA World Cup in Spain but as we edge ever closer to the tournament, there is no getting away from the fact that excitement is starting to build.